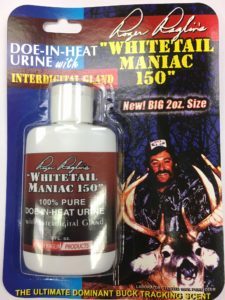 In 1992 Roger Raglin killed five whitetail bucks over 150 B&C point and this maniac 150 helped him accomplish that way back then and every year since! This is the best tool he has to attract and shoot big bucks. Approximately 300 yards from your stand, apply ample amount to a rag in order to create a scent trail. Re-apply more scent to your rag and leave it in an open shooting lane near your stand and get ready for action! You can use this product all deer season long and it can attract does too.